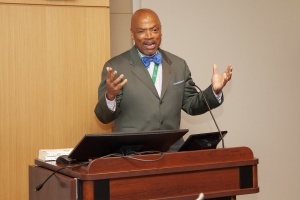 Dean Henri Ford speaks at the WIAM event. 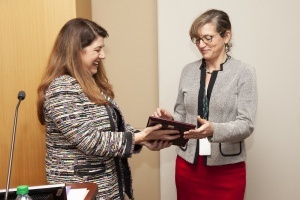 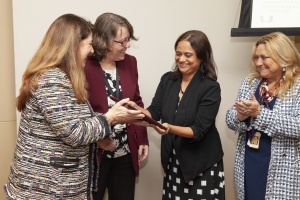 Sapna Deo, M.D., receives her award along with the chair of her department, Sylvia Daunert, Pharm.D., MS, Ph.D., right. 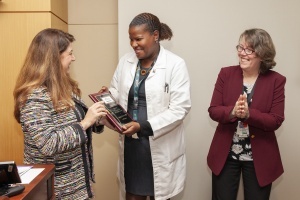 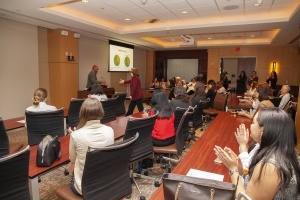 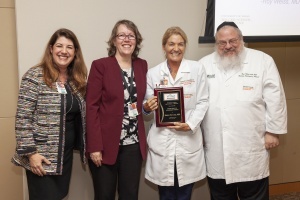 From left, Hilit F. Mechaber, M.D., Rose Van Zuilen, Ph.D., Tanira Ferreira, M.D., and Department of Medicine Chair Roy E. Weiss, M.D., Ph.D.
Hilit F. Mechaber, M.D., presents Elizabeth Franzmann, M.D., with her award. 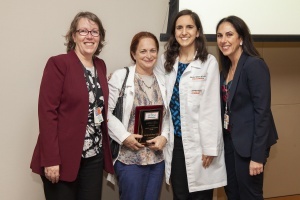 From left, Rose Van Zuilen, M.D., Marilyn Glassberg, M.D., Sabrina Taldone, M.D., MBA and Lilian Abbo, M.D.